For over 130 years Poles have been moving into Cheektowaga and calling it home. Once there they built houses, started churches, got involved in politics, established businesses, and eventually became the sixth largest Polish American Community in the U.S. by population 37,560 and the largest Polish Community in the U.S. by percentage, 39.9%. On the western edge of the town is the Village of Sloan. Popularly known as the “Capital of Cheektowaga” and the “The Second Happiest Place on Earth,” Sloan’s Polish population once reached the staggering height of 75%. The hamlet of Sloan was incorporated into a village in 1896 with Poles settling in the area in the early 1900s. To meet their religious needs, many of them had to travel to the Irish parish of Visitation or the German St. Agnes in Buffalo’s Lovejoy neighborhood. If they wanted to be with fellow Poles they walked to St. John Kanty’s over a mile away. This trek put them in danger due to all the railroads they had to cross as under and overpasses were not yet installed on Broadway or Bailey Avenue. Because of this, the bishop instructed the priest at St. John Kanty’s, the Right Reveverend Andrew Garstka to organize the families into a church. 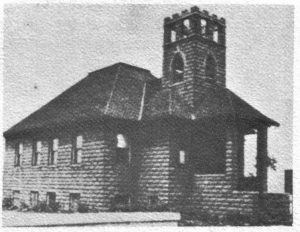 Grastka gathered the parishioners, rented a protestant church, and on February 14, 1915 established St. Andrew’s Church. The church would become a focal point and a draw for Poles wanting to move into the village. In Sloan one person saw the potential of this developing community, Franciszek Ruszkiewicz. Frank the owner of the Polish language newspaper, Dziennik dla Wszystkich saw the potential of Sloan and bought tracts of land in the village. He began developing homes in much of the east side of the village and created a suburb in the early 1920s. Although a sizable population, Poles did not enter Sloan politics until 1922 with the appointment of Stephen Rubach as village clerk. It would take another 11 years for Poles to elect one of their own, but in 1933 Joseph Kistowski became Sloan’s first Polish mayor. Poles did serve as public servants before this time. Sloan was part of the beat of Cheektowaga’s first Polish constable Frank Wesolek, who worked the area starting in 1907. As the area grew and flourished, Poles began opening up their own businesses. Soon everything one could need could be found in Sloan The Sliwinskis ran John’s Liquor Store on Broadway, Cwikalowski Funeral Home opened on Crocker Street, while Leo V. Kudla operated his bar and restaurant on Reiman. Food stuffs could be purchased at Nowicki’s Groceries and Meats, women could get their hair done by Sharon Chalupks or Terry Lampka at the Reiman Beauty Shop, and if you needed insurance, the Sulkowski Agency would take care of you. 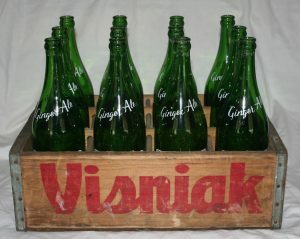 One of Sloan’s most recognizable Polish businesses was Visniak Soda. Visniak, which is Polish for cherry, started in 1959 by Ray Pijanowski on Reiman Street. Visniak bought out Fillmore Bottling and eventually became one of Western New York’s most recognizable pop brands. Sadly the company closed in 2004. Another well-known Sloan institution is Kiebzak’s Restaurant at Crocker and Gates. Opened just after World War II by Joseph and Constance Kiebzak, the restaurant became famous for its fish fries, pierogi, and other Polish and American fare. Despite the changing demographics of Sloan, Polish Americans have left their mark, politically, culturally, and historically in this corner of Erie County. St. Andrew's Parish, Golden Jubilee, 1915-1965. N.p. : Sunrise, 1965. Print.